Looking for something for your kiddo to do while on school break? How about a few hours of a supervised Museum Adventure? 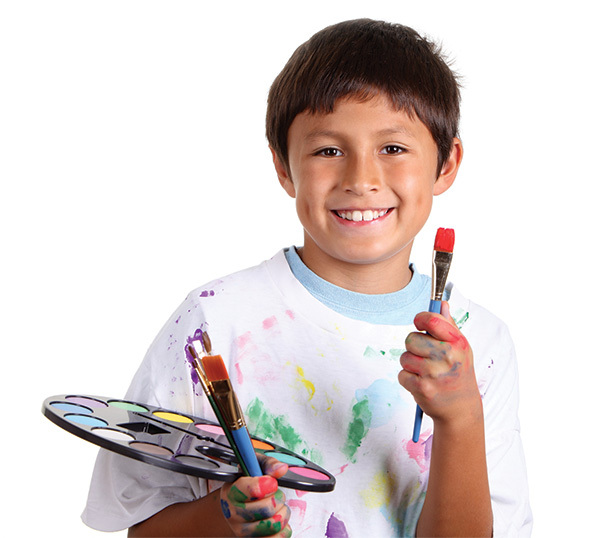 Each class will explore a new topic and complete exciting creative projects. Please see registration below policy for more details. Registration begins April 2nd at 10:00 am. Each Museum Adventures class will create several projects during the one-day workshop. As weather allows, classes will visit the courtyard behind Daz Bog for lunch breaks and may also take tours of Museum exhibits and outdoor public art near the Museum. Please see registration below policy for more details. Create a kinetic sculpture wind chime with repurposed metal hardware, found objects, and wire to create a variety of sounds! Like Tinguely’s machines and pop artist Calder, each sculpture will have a unique “voice”. We will also get a chance to tour the Museum’s Musical Association and Pop Art exhibits for inspiration. Tour “Quest for Power” by Amelia Furman and the Museum’s quilt exhibit, then create your own fabulous art! Create a unique layered mixed media landscape on canvas with torn tissue paper, text and acrylic paint. Then, make a modern and expressive quilt with the unexpected medium of wire, string, and beads! These awesome insects are inspired by ants, fireflies, and other winged friends! We will create 3D art from beads, wires, and clay to make quirky little creatures. Permission to Play with Your Food! Using stencils and high flow acrylics, we will make all kinds of exciting abstracts. No drawing skills needed but emphasis will be placed on composition. We depend on your enrollment for a successful class. Please plan your schedule carefully to avoid cancellations. If you must cancel your registration, please call (970) 962-2410 at least five (5) business days before the class. You may choose to transfer to another class, retain a credit for a future class, or receive your money back. Cancellations made after the above deadline are creditable or refundable at 50% of the registration fee. If you do not call to cancel or do not show up for a class, your registration fee will be forfeited. For refunds, please allow for two weeks for checks to be processed. The Museum has the right to cancel classes. If class enrollment is below the minimum requirement, a class may be cancelled. Class cancellation decisions are made three (3) days prior to class.